According to biblical teaching, God directly brought into existence not the world per se, but an amorphous chaos of universal elements. But the almighty power of divine creation instilled into the essence of this chaos an immutable law of systematic development; thus, as soon as the chaos appeared, there sequentially began to be accomplished within it that which God said about it (Genesis 1, 2), i.e. in the necessary processes of its mechanical creation blind nature gradually began to carry out that which was pre-eternally comprised within the divine design for the world. Therefore, at each step of its sequential development nature invariably turned out to be worthy of its Creator, and God Himself invariably praised it as “good’; moreover, He enhanced its creative activity by creating the first people on earth. The biblical narrative tells us that man was created by God not through the mechanical forces of nature, but by a direct act of divine power, which formed man’s physical organism out of the earth and imparted to him a special soul in the image of God’s personal being, and so in this, too, was quite obviously realized God’s design, which served as the pre-eternal foundation for the existence of the world and in which is expressed the eternal purpose of this existence. The biblical narrative further assures us that in the initial period of its existence the world truly accorded with this purpose of creation. The Bible definitely indicates that the creation of the world was achieved over the course of six days. But if these days bear any likeness to our days, then it is only in terms of the periodic alternation of evening and morning, and certainly not in terms of the duration of time from morning to evening, because the duration of our day is defined by the time it takes for the earth to make one revolution around its axis, while on the first day of creation, according to the Bible’s description of the process of universal creation, our earth did not yet exist. From the point of view of biblical cosmology, the primeval chaos at first undoubtedly organized itself into a dense indivisible mass and formed a single material body of matter, because the break-up of universal matter into a multitude of individual planetary worlds, by biblical indication, occurred only on the second day of creation, our earth was formed only on the third day, while the entire matter of our planetary world fashioned itself into a solar system only on the fourth day of creation, and thus only on this fourth day of creation was finally achieved the 24-hour alternation of our day and night. Thus the first days of creation could under no circumstance be like our days, and thus there is no doubt that they were days of a totally different kind. What kind of days were they? On the basis of the universal laws of physics and mechanics, we can picture the initial process of universal creation as a complex process of the joining and the breakup of the chaotic mass in a continuous redistribution of matter and motion. Due to just the mutual attraction of the material elements of chaos, there inevitably had to occur within it a mechanical formation of stable masses of matter, and the greatest of these stable masses inevitably had to become the central point of universal gravitation. In other words, all dispersed elements of the chaos, as well as linked groups of these elements, inevitably had to fall upon this greatest mass and specifically upon the center of this mass, and thus out of their mobile totality there invariably had to emerge a spherical material body. However, it is obvious that a multitude of elements falling upon one and the same center and along one and the same straight line in reality cannot fall on one and the same point in space. Therefore, when the chaos became organized into a material body, its farthest elements had to be discarded, and thus their relation to the center of universal gravitation in reality had to be expressed in terms of repellence. Consequently, despite the cohesion of the primeval globe, by the law of centrifugal motion a powerful stream of matter had to be rushing towards its equator, and this powerful movement would have constituted a limitless source of the physical energy of light, even though our sun did not yet exist. In this case the single revolution of the universal globe around its axis naturally had to produce a change of evening and morning at its poles, and thus form a single day. But exactly how long was the duration of this firstday of creation we will never know of course, because we will never know the entire planetary world of the universe and, therefore, we will never be able to calculate the entire mass of matter in the universe. However, to provide some satisfaction to human scientific curiosity, we may at least illustrate the enormity of this issue through existing attempts to calculate the duration of the second day. According to the biblical narrative, the universal globe in its universal unity had time to make only one revolution around its axis and to create only one day, and then the centrifugal force in the mobile masses of matter around the equatorial belt overcame the force of centripetal motion, so that on the second day of creation these masses were dispersed into space along the tangents of their movement, and in this manner a myriad of individual world bodies emerged, united among themselves, of course, by a single center of universal gravitation and invariably subordinate to the same law of physical evolution that had just been realized in the activity of the universal globe. On that same second day of creation the material mass of our solar system also emerged, but this mass existed in its complex enormity likewise only one day, because in the subsequent period of the third and fourth days it similarly broke up, in turn, into a system of individual bodies of our planetary world. This world is known to us to a certain extent, and we may propose certain scientific hypotheses concerning it. Knowing the mass of each individual planet of our solar system, and allowing the density of matter in the past to have been such that the mass of our entire system occupied a space equal to the current orbit of the Earth, astronomer Babinet calculated that in terms of the present measurement of time it took 3,181 years for this mass to make one complete revolution around its axis. Of course this calculation cannot in the least degree pretend to be an exact astronomical measurement of the actual duration of the second day of creation, but as a conditional hypothesis it can still provide us with a certain understanding of how long the second day of creation may have lasted. And this same calculation may also give us a certain understanding of the length of the first day of creation, the duration of which was to be measured by one complete revolution of the mass of all the planetary worlds in the universe around its axis, since at that time there could be no other measurement of time. In any case, when some astronomers and geologists speak of thousands of years that were needed for the formation of the world, although such calculations cannot be absolutely reliable, at the same time there is nothing unbelievable in them, and at least there is nothing in them that contradicts biblical teaching. The days of creation described in the Bible by the prophet Moses have been considered for a long time and by a great number of theologians as being periods of great duration. And this is not without foundation. Firstly, one should not forget the well-known words of the Old and New Testaments: “One day is with the Lord as a thousand years, and a thousand years as one day” (2 Peter 3:8; Psalms 90:4). Secondly, one should bear in mind that in describing the creation Moses lists not six days, but seven, and naturally all the days in this cosmological week should be regarded as being so-to-speak equal and typical. The last day, however, the seventh day, when in God’s relation with the world creation was replaced by nurture, continues to the present time, for of all other days it was said: and there was the evening and the morning of such-and-such a day, i.e. a completely finished cycle was presented, while the seventh day is not so indicated. Thus the seventh day is continuing and will continue to the very end of time, which for this reason is called the eighth day. Thus, if the seventh day should be properly understood as a period of time lasting millennia, then the days that preceded it should be regarded accordingly. And finally, let no one think that to understand these days in terms of long periods of time is a new thing. A number of Church Fathers, some of them quite authoritative, understood them in a similar manner – as, for example, Saints Clement of Alexandria (2nd century), Athanasius the Great (4th century), Basil the Great (4th century), blessed Augustine (4th-5th century), and others. “In the beginning God created the heaven and the earth. And the earth was without form, and void; and darkness was upon the face of the deep. And the Spirit of God moved upon the face of the waters” (Gen. 1:1-2): such was the initial or general creative act of God. The formless matter or chaos is called “the deep,” as an immense space unbounded by anything, and “water,” as aqueous or gaseous matter. “Darkness was upon the face of the deep,” i.e. the entire chaotic mass was submersed in darkness due to absolute absence of light. “And the Spirit of God moved upon the face of the waters”: here is the beginning of God’s formative creativity. In accordance with the meaning of the word “moved” (the Hebrew word used here has the following meaning: embraced all matter as a bird spreads its wings to embrace and warm its chicks), the action of the Spirit of God upon primordial matter should be understood as transmission to it of the living force necessary for its formation and development. The first act of God’s formative creativity was the creation of light: “And God said: let there be light! And there was light. – And the evening and the morning were the first day” (1:3-5). This narrative appears to contradict the sensory perception that regards light as emanating from the sun. But the writer of Genesis goes even further. From the very first appearance of light he surmises the correct sequence of day and night, while according to universal observation this sequence is related to the appearance and disappearance of the sun. In former times this circumstance served as an inexhaustible source of mockery of the Genesis on the part of such free-thinkers as Voltaire and others. Meanwhile, the most recent scientific researches confirm the veracity of the Biblical narrative. They prove conclusively that by its nature light is completely independent of the sun. It is the result (consequence) of the vibration of the atmosphere, which now occurs primarily through the sun, but which can be produced by many other causes. Just as a taut string vibrates not only from the touch of a bow upon it, but from other reasons, such as a simple movement of air, so could the atmosphere, which now vibrates as a result of the periodic influences of the sun, diffuse its light waves without the sun and before it. Thus Moses positively established this scientific fact thousands of years before science. Even more amazing is his surmised sequence of change of day and night before the appearance of the sun. But in this regard the latest scientific discoveries also satisfactorily explain such an occurrence. If the primordial light appeared before the sun and could have been, like the light of our aurora borealis for example, the result of the union of two opposing electrical currents, then there obviously must have been moments when this light began, reached its most intense brightness, and then once again diminished and disappeared. Thus, in the words of the Biblical narrative, there could have been night and day before the appearance of the sun which usually serves as the criterion for determining these segments of time. Once again the question arises: how could Moses have known these purely scientific facts before science? The only answer to this can be that his writing was inspired from above. The second creative act forms the firmament. “And God said: let there be firmament in the midst of the waters, and let it divide the waters from the waters. And it was so. And God made the firmament, and divided the waters which were under the firmament from the waters which were above the firmament. And God called the firmament Heaven. And God saw that it was good. And the evening and the morning were the second day” (1:6-8). The firmament is the aerial space, or the visible sky. The origin of the firmament or the visible sky can be imagined thusly. The immeasurably immense mass of primordial aqueous matter suddenly broke up by God’s command into millions of individual spheres, which began whirling on their axes and sped along their individual orbits. 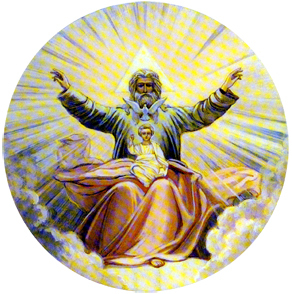 The space which emerged between these spheres became the firmament; for within this space the movement of the newly-created worlds was established by the Lord according to definite and immutable laws of gravity, so that they did not collide with one another and did not impede each other’s movement. The waters above the firmament were these newly-created worlds, which subsequently shaped up and from the fourth day of creation began shining and glittering above our heads, while as to the waters under the firmament – that was our planet Earth. All of this was still called water, because on the second day of creation it still had not received a firm arrangement or solid shape. The Earth was subsequently so arranged that life appeared on it, although only the lowest form of it, specifically vegetative life. “And God said: let the waters under the heavens be gathered together into one place, and let dry land appear. And it was so. And God called the dry land earth; and the gathering together of the waters called He seas. And God said: let the earth bring forth grass, the herb yielding seed after his kind, and the fruit tree yielding fruit after his kind, whose seed is in itself, upon the earth. And God saw that it was good. And the evening and the morning were the third day” (1:9-13). The separation of the waters from the dry land on the third day should not be imagined as a simple event, as a distillation of ready-made water from solid segments of earth, so-to-speak. Water did not yet exist in the form and the chemical composition that we know today. Thus, firstly, by the Lord’s creative word the ugly and shapeless matter of our planet was transformed on the third day of the world into two forms: water and dry land were created, and the latter immediately formed on its surface various reservoirs for water: rivers, lakes, and seas. Secondly, our planet became clothed in a thin and transparent veil of atmosphere, and gases appeared with their numerous admixtures. Thirdly, even land itself became the subject of creative activity – not only on its surface, with the formation of mountains, valleys, etc., but within its very bowels – with the formation of its various strata, metals, minerals, etc. Fourthly, by the Creator’s special command there appeared all kinds of vegetation on Earth. Finally, it should be presumed that on the third day of the world all the other dark and chaotic masses of celestial bodies received their final arrangement in accordance with their purpose. Science knows the remnants of this vegetation, which amazes by its majestic size. That which is now an insignificant blade of grass, as our fern for example, in primordial times was an immense tree. The threads of our modern moss in primordial times were almost two meters in diameter. This raises an objection: how could this mighty vegetation have been produced without the influence of the sun’s rays, which shone upon the Earth only on the next, the fourth day? And in this case, too, scientific research irrefutably confirms the Biblical narrative. It has now been proven that plants only need light in general and not sunlight exclusively; and, as we know, light already existed from the very first day of creation. Experiments were made with electrical light, which was found to contain all the qualities necessary to the growth of vegetation. The scientist Famintsyn achieved important results in this respect even with the help of the intensified light of a simple kerosene lamp. However, another objection arises: in that same layer of earth in which traces of organic life appear for the first time, and in which according to the Biblical narrative the earth produced only vegetation, together with the plants we also find animal organisms: corals and mollusks and gelatinous animals in simplest forms. But this objection can also be dismissed: the Earth’s layers are not separated one from another by an impermeable wall; on the contrary, during the Earth’s thousands of years there were all kinds of fluctuations and changes in their arrangement, as a result of which they became mixed together and moved from one to the other. Although the vegetation was able to develop under the influence of primordial light, its development under such circumstances, however, could not have resulted in the infinite variety we see in it today. Majestic in size, it was meager in form and color. It did not consist of anything but green vegetation: we do not come upon a single flower in the strata of the coal period. Apparently it needed the measured light of our current celestial bodies. The Earth’s arrangement was followed by the establishment of the celestial bodies. “And God said: let there be lights in the firmament of the heaven to divide the day from the night, and let them be for signs, and for seasons, and for days, and years; and let them be for lights in the firmament of the heaven to give light upon the earth. And it was so. And God made two great lights: the greater light to rule the day, and the lesser light to rule the night, and He made stars also. And God set them in the firmament of the heaven… and God saw that it was good. And the evening and the morning were the fourth day” (Genesis 1:14-19). The creative command “let there be lights” is obviously on a par with the Creator’s previous commands: “let there be light… let the waters be gathered together,” and just as those do not signify original creation, but rather the creative formation of objects, so here, too, this must be understood not as a new creation, but only as a complete arrangement of the heavenly bodies. How should one imagine the origin of the celestial bodies? With their inner and basic material the celestial bodies already existed before the fourth day; they were that water above the firmament, out of which were formed the countless spherical bodies on the second day of creation. On the fourth day some of these bodies were so arranged that the first-created light became concentrated within them to the highest degree and began to shine most intensely along their entire surface, – these are the luminescent bodies in the strictest sense; such, for example, are the sun and the fixed stars. The other dark spherical bodies remained dark, but were adapted by the Creator to reflect the light that shone upon them from the luminescent bodies; such, for example, are the planets that glow with borrowed light, e.g. the moon, Jupiter, Saturn, and other planets. On the fifth day were created the creatures living in the water and flying in the air, i.e. the fish and fowl. “And God said: Let the waters bring forth abundantly the moving creature that hath life, and fowl that may fly above the earth in the open firmament of heaven. And it was so. And God created great whales… and God saw that it was good. And God blessed them, saying: be fruitful, and multiply, and fill the waters in the seas, and let fowl multiply in the earth. And the evening and the morning were the fifth day” (1:20-23). God’s creative command naturally forms these species of creatures out of earthly elements; but as everywhere else, so here, too, and here even more than in the preceding instances, the power of formation belongs to Him and not to material elements, because with the formation of these creatures there is introduced into nature a new and higher beginning of life: there now appear living, moving, and sentient creatures. In granting the newly-created creatures His blessing to multiply, it is as if God turns into their own property that force through which they had received their existence, i.e. He gives them the capability of reproducing new creatures from themselves, each in his own kind. The heavens were being adorned with celestial bodies, gigantic vegetation was developing on earth, but there were still no living creatures on earth who could enjoy nature’s gifts. Up to now there had not yet been the proper conditions for their existence, since the air was saturated with harmful vapors that could only promote the plant kingdom. The atmosphere still contained so many extraneous admixtures, and primarily carbonic acid, that it was still impossible for animal life to exist. The atmosphere first had to be cleared of admixtures that were harmful to life. This task was fulfilled by the gigantic vegetation under the influence of the sun which shone forth on the fourth day. Carbonic acid constitutes one of the most essential elements of plant life, and since the atmosphere was saturated with it, the created vegetation began developing quickly and grandiosely, absorbing the carbonic acid and clearing the atmosphere of it. The huge deposits of coal are nothing else but that same atmospheric carbonic acid, transformed by the vegetation into a solid body. Thus took place the purification of the atmosphere, and when proper conditions for the existence of life were prepared, it did not delay in appearing by dint of a new creative act. “And God said: Let the waters bring forth abundantly the moving creature that hath life, and fowl that may fly above the earth in the open firmament of heaven.” By dint of this Divine command a new creative act was performed, not only formative, as in the preceding days, but creative in the fullest sense, as was the first act of creation of primordial matter – out of nothing. The most recent geological findings explain and add to this brief narrative by the writer of Genesis. Descending into the depths of the earth’s layers, geologists have reached a stratum in which for the first time appears a “creature that hath life.” This stratum is consequently the cradle of animal life, and it contains the simplest animal organisms. The most ancient “creature that hath life” known to geology is the so-called Eozoon canadense (“the dawn animal of Canada”), which was found in the lowest limestone blocks of the so-called Laurentian period. Then came the corals and the infusoria, as well as various crab-like organisms, and in higher strata come the gigantic crawling monsters and lizards. The most well-known of these are the ichtiosaurus, the gilasaurus, the plesiosaurus, and the pterodactyl. All of them are awesome because of their gigantic size. The ichtiosaurus was up to 40 feet long, looked like a lizard with the head of a dolphin and the teeth of a crocodile, while his tail was equipped with a leathery fish fin. The gilasaurus was up to 7 feet high and looked like a fearful lizard. The plesiosaurus looked like a gigantic turtle with a 20-foot long neck, a small snake-like head and a 6-foot long sting. The pterodactyl looked like a flying dragon, with wings, a long head, crocodile teeth, and tiger claws, – it generally looked like a huge-sized bat with an almost 10-foot wing span. Some of these monsters can be seen even now, but their modern representatives are insignificant dwarfs in comparison with their ancestors. So weak has become the productive force of aging earth! And finally the animals living on earth are created from the earth (i.e. from the earthly elements): cattle or large four-legged animals who are able to live with man and to serve him, the reptiles – the crawling animals, and the beasts – the four-legged wild animals who live freely on earth. “And God said: Let the earth bring forth the living creature after his kind, cattle, and creeping thing, and beast of the earth after his kind. And it was so. And God made the beast of the earth after his kind, and cattle after their kind, and everything that creepeth upon the earth after his kind. And God saw that it was good” (1:24-25). Scientific research, ascending the ladder of the earth’s strata, after the stratum containing the above-mentioned monsters, fish, and fowl, comes across a new stratum in which it finds new organisms – the four-legged ones. The first to appear on earth were the gigantic four-legged species that no longer exist today – the dinossaurus, the mastodon, and the mammoth (kinds of elephants with huge and clumsy forms), then the more perfect animals and, finally, their present forms – lions, tigers, bears, cattle, etc. Looking at this gradual appearance of species, science involuntarily poses the question: how did these species become formed? Do they represent unchangeable forms that received their beginning in an act of creative formation, or did they gradually develop one from another and all from a single primary species? In the last century the well-known Darwin’s theory– the theory of so-called gradual evolution – became widespread. How does it relate to the Biblical account of creation? The writer of Genesis says that the plants and the animals were created “after their kind,” i.e. not only a single plant or animal form, but many plants and animals. But this does not mean that all the species existing today owe their origin to the original creative act. The Jewish word “min,” translated in the sense of “kind,” has a very wide meaning that does not fit within the framework of the technically scientific meaning of the word “species.” In any case it has a much wider application, and without encompassing all current kinds and varieties of animals and plants, it does not deny the possibility of a gradual perfection of forms. However, that an actual change in forms is possible has been proven by irrefutable facts. Many kinds of roses, carnations, and hydrangea, and many kinds of chicken and pigeons that can be seen in zoos, have developed not more than a century ago. Changes also occur under the influence of diverse climatic conditions, differences in soil, nourishment, etc. On the basis of this it may be assumed that the quantity of plant and animal forms in the primordial world was not as great and varied as it is now. The Book of Genesis, in telling us that creation in its strict sense (“bara”) occurred only in the creation of the first beginnings of organic animal life, and afterwards there occurred simply formation, does likewise not deny the possibility of development of species within their own kind. However, this does not provide any foundation for accepting the theory of evolution in its entirety: the Bible clearly asserts that animals and plants were directly created “in their own kind,” i.e. in varied but definite forms. (a) As strict scientific observations and research show, changes within plant and animal forms are possible only within the most limited bounds. This situation obtains not only for the present, but also for the most ancient times, as far as it is possible to judge from ancient writings. The oldest images on Egyptian and Assyrian monuments show that their breeds of domestic animals were exactly the same as ours: the ibis is still the same as it was in the times of the pharaohs, as its preserved mummies show; the seeds of wheat and barley found in the Egyptian pyramids do not in any way differ from present ones. (b) Further: if, according to the theory of evolution, species are formed as a result of a randomly-occurring change in a particular species that gradually continues to increase, then, in view of the full possibility of such changes occurring in all directions, one could expect to see a most variegated and unbalanced variety and mixture of forms in today’s plant and animal world. However, in reality there is a strict gradation of species that are clearly distinct one from another. (c) The gradualness that can be observed in the development of plant and animal life also does not confirm the theory of evolution. An analysis of fossils in various earth formations does, in fact, show that lower classes of plants and animals generally come before higher ones. However, the strict gradualness and sequence of development that is to be expected according to the theory of evolution does not exist, since in the earliest formations, along with simple organisms one can already find considerably more developed ones belonging to higher classes. (d) Neither does one find those transitional forms that are necessary for confirmation of this theory. Everywhere the species are strictly distinguished one from the other. (e) But the greatest difficulty for this theory is represented by the question of the formation of new organs. This theory is built on the possibility of change in existing organs; but how could new organs be created by means of change, how could eyes have been formed in infusoria over the course of time, how nothing could have been changed into something – that the theory of evolution is incapable of explaining. (f) And finally, the very reasons for the change, being supposedly random, do not in any way accord with the harmony and purposefulness that is to be observed in the plant and animal world. All these facts very forcefully confirm the authenticity of the Biblical teaching that in their general forms the plant and animal organisms owe their being to a creative act. On the sixth day of creation, all parts of the earth became populated with living creatures. The world of living creatures was like a stately tree, whose roots represented the simplest animals and whose upper branches were the highest ones. But this tree was not yet finished, it did not have a crown that would complete and adorn it, there was still no man – king of nature. But finally he, too, appeared. “And God said: let Us make man in Our image, after Our likeness; and let them have dominion over the fish of the sea, and over the fowl of the air, and over the cattle, and over all the earth, and over every creeping thing that creepeth upon the earth. So God created man in His own image, in the image of God created He him, male and female created He them.” Here for the third time there occurred in the fullest sense a creative act (“bara”), for man in his essence again has something that did not exist in the nature created before him, and that is the spirit, which distinguishes him from all other creatures. The theory of evolution, which attempts to place man on the level of a simply perfected species of animal, completely contradicts this Biblical teaching. However, at the present time this theory has been subjected to so many refutations by authoritative representatives of anthropology, that Darwinism’s inability to shake the clear teaching of the writer of Genesis becomes more and more obvious. Thus ended the account of the creation and formation of the world. “And God saw everything that He had made, and, behold, it was very good. And the evening and the morning were the sixth day. This was the beginning of the establishment of Saturday as a day of rest, and upon this establishment the proper succession of work and rest in human life is founded to this day.